What Is ‘Regulatory Science’ and Why Is It Here to Stay? Regulatory science is new to the research lexicon. When Dr. Ira Shoulson began his career as a neurologist, he knew he wanted to focus on the clinical development of experiment therapeutics for neurodegenerative diseases. For nearly 30 years, Ira has been an integral leader in the design of large international, multicenter clinical trials for neurodegenerative diseases. He also dedicated himself to mentoring fellows in the development of experimental therapeutics. Later, as the FDA re-branded ‘regulatory science’ as an applied, evidence-based science used to discover novel ways to improve development of medical products, Ira realized that was what he and his colleagues had been doing all along. After 25 years at the University of Rochester, Dr. Shoulson went to Georgetown University to develop its Program for Regulatory Science and Medicine (PRSM). Soon thereafter, the FDA awarded Georgetown a Center of Excellence in Regulatory Science and Innovation (CERSI), providing funding and close collaboration opportunities for research and training initiatives. In 2014, a fellowship in regulatory science was established. This fellowship combines formal classroom instruction with innovative research projects guided by mentors from academia, industry, and the FDA. As one of the fellows in this program, I am working on a research project focused on using real world data collected with electronic health records to inform confirmatory basket trial designs. Since people with different diseases may share common disease features, and may benefit from the same drug, a basket trial can improve efficacy and reduce the cost of clinical development for drugs benefitting patients with rare diseases. My interest in drug development and regulation began while getting a PhD in biomedical sciences at The Ohio State University. During that time, I worked in the chronic lymphocytic leukemia laboratory under the mentorship of Dr. John Byrd and Dr. Amy Johnson. Patient-focused research was paramount to our efforts. I had the opportunity to work on projects that honed my skills in molecular biology, while also working with samples and data from clinical trial patients, delving into biomarker discovery, and understanding drug resistance mechanisms. This unique experience gave me the drive to pursue a career in regulatory science. One of the most rewarding benefits of this fellowship has been to glean from Ira his infectious enthusiasm for exploration and innovative science. He believes that diverse mentoring is key, and he encourages a reverse mentoring style, allowing his fellows to ask questions and open a dialogue for discovering solutions. This practice creates an environment in which everyone is learning, compared to one that is purely didactic. In only six months as a fellow in regulatory science, I have learned that it is a diverse and applied field that requires collaboration. To succeed as a regulatory scientist, it is necessary to experience first hand the applications and frustrations associated with generating new knowledge. It is important to become involved in all aspects of research, from molecular mechanisms to broad public health applications. It is key to learn through extensive reading and taking courses on a wide range of subjects. Most importantly, I have learned the value of a diverse network of collaborators working together to accomplish a common goal. The concept of collaborative research to improve public health was exemplified at the Friends of Cancer Research Annual meeting. As a travel awardee, I found the opportunity to attend the annual meeting invaluable. At the pre-meeting dinner and the annual meeting, I met key thought leaders in the oncology field to discuss topics relevant to my research, such as the integration of real world data into the drug development paradigm. The term ‘regulatory science’ does not always resonate because it is new to the lexicon. But I recognize it is a valuable discipline, and a science here to stay. Daphne Guinn has her PhD in biomedical sciences from The Ohio State University and currently works as a PRSM-PhRMA fellow at Georgetown University where she’s studying regulatory science. 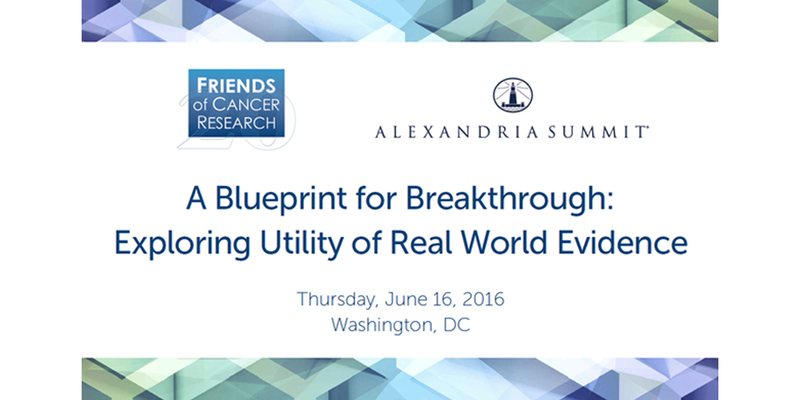 She was a Friends of Cancer Research travel awardee to attend the 2016 Friends Annual Meeting.